The Old Foodie: Thankyou Erasmus. Tonic water, that essential diluent for gin, was patented by Erasmus Bond in London on this day in 1858. Thankyou Erasmus. The bitter ingredient in tonic water is quinine (or more commonly nowadays a synthetic mimic), which comes from the bark of the South American Cinchona tree. The bark was used in ancient times by the indigenous people of South America for the treatment of fevers, and it came to the attention of the European usurpers in the seventeenth century as a malaria medicine. How this very bitter ingredient became a drink mixer is attributed to the British in India, who disguised its taste with sugar, lemon – and gin. 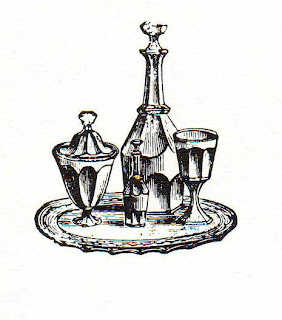 The nasty “mother’s ruin” of eighteenth century England became the elegant drink of the Colonial masters. The amount of quinine in regular tonic water nowadays is well below the amount required to prevent or treat malaria, but I would argue that when mixed with gin it still has a therapeutic effect. After chopping fine and pounding the white meat of turkey or fowl, add enough of white sauce to pass it through a sieve, flavoured with lemon-peel and juice, or lemon pickle, and a little cucumber ketchup. This may be heaped in the middle of a dish and garnished with the broiled legs, or it may be served in a wall of mashed potatoes, or rice egged over and browned; if rice, strew upon the egg some fine bread-crumbs before browning. I reckon if you heap this in a dish it would make a fine and elegant 'pate". A modern processor would help in the making too. If you are still drinking G&T's at supper, here is a nice, versatile dish to try. Scrape a quarter of a pound each of Cheshire and Gloucester cheese, and good fresh butter; beat all in a mortar with the yolks of four eggs and the inside of a small French roll boiled in cream till soft; mix the paste with the whites of eggs previously beaten, and put into small paper pans made rather longer than square, and bake in a Dutch oven till of a fine brown. They should be eaten quite hot. Some like the addition of a glass of white wine. The batter for ramakins is equally good over macaroni when boiled tender; or on stewed brocoli, celery, or cauliflower; a little of the gravy they have been stewed in being put in the dish. What contemptible scoundrel stole the cork from my lunch? W.C Fields. We are just initiating the summer season here this weekend, and you remind me that a gin and tonic would be a nice way to celebrate! I wonder if I can find a Gin and Tonic cake for you to make?